Stop spending a fortune on home heating! Follow practical and easy tips from our infographic to hold down your heating costs and keep your house warm and cozy this winter. 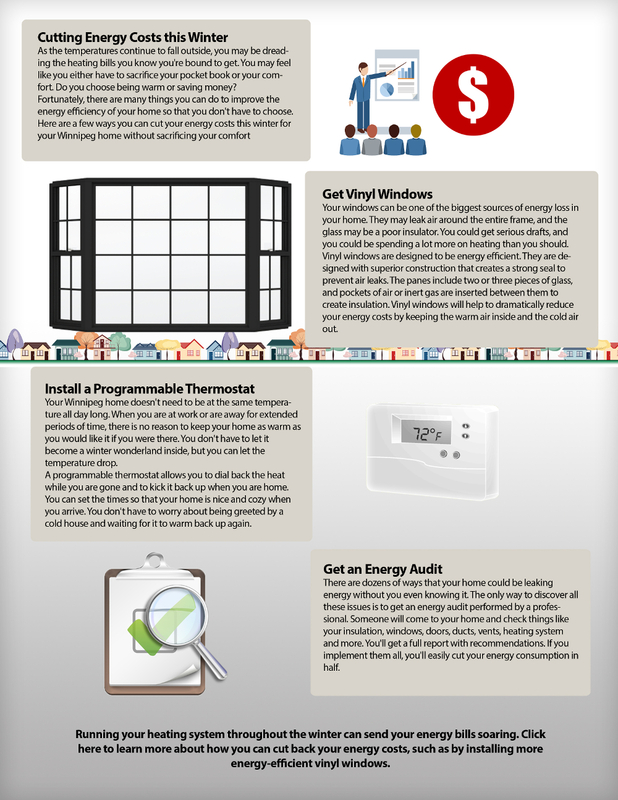 Check few ways to improve the energy efficiency of your home today. As the temperatures continue to fall outside, you may be dreading the heating bills you know you're bound to get. You may feel like you either have to sacrifice your pocket book or your comfort. Do you choose being warm or saving money? Your windows can be one of the biggest sources of energy loss in your home. They may leak air around the entire frame, and the glass may be a poor insulator. You could get serious drafts, and you could be spending a lot more on heating than you should. Vinyl windows are designed to be energy efficient. They are designed with superior construction that creates a strong seal to prevent air leaks. The panes include two or three pieces of glass, and pockets of air or inert gas are inserted between them to create insulation. Vinyl windows will help to dramatically reduce your energy costs by keeping the warm air inside and the cold air out. Your Winnipeg home doesn't need to be at the same temperature all day long. When you are at work or are away for extended periods of time, there is no reason to keep your home as warm as you would like it if you were there. You don't have to let it become a winter wonderland inside, but you can let the temperature drop. A programmable thermostat allows you to dial back the heat while you are gone and to kick it back up when you are home. You can set the times so that your home is nice and cozy when you arrive. You don't have to worry about being greeted by a cold house and waiting for it to warm back up again. There are dozens of ways that your home could be leaking energy without you even knowing it. The only way to discover all these issues is to get an energy audit performed by a professional. Someone will come to your home and check things like your insulation, windows, doors, ducts, vents, heating system and more. You'll get a full report with recommendations. If you implement them all, you'll easily cut your energy consumption in half. Don't spend a fortune on heating this winter. Check this offer and get the best price for windows in Winnipeg, and consider getting a programmable thermostat and an energy audit. You'll soon start reaping the savings you want.